Computta.com is a very suspicious cryptocurrency mining application, which is given out for free. Why do we call it suspicious? Simple: it promises to mine bitcoins for you, using the computing power of your home PC or laptop. Everyone who knows anything about Bitcoin, knows that attempting to mine BTC through a regular computer/PC is an exercise in futility. It has been that way for years now. Not only does it not work, it is guaranteed to turn the user’s PC into a stove, and eventually to burn it to the ground. Even if the hardware didn’t go to waste, the effort would simply never generate enough profit to cover the cost of the electricity used up with the mining. To mine these days, special ASICs are needed, like the Antminer S9, which are optimized for mining and are equipped with massive heat sinks and cooling fans. Several of these specialized devices are needed if one intends to make any kind of a headway. The bottom line therefore is that Bitcoin mining through a computer is an old wives tale. Computta.com is most probably a scam, which lures people into lending the perpetrators the computing power (not to mention the consumed electricity) of their laptop/home computer, for free. It is also a Ponzi scheme: it features an affiliate setup which requires participants to get others to sign up and to install the software on their computers. This is how “fresh blood” is brought into this equation. You will say: it’s all free though…what is there to lose? A lot. If you know the crypto currency vertical and its ins and outs, you also know that there are actual virus-type applications out there, which infect people’s computers and begin mining crytpcurrencies in the background, hogging up the resources, and making use of them just enough to not significantly disrupt the capabilities of these machines. How can such schemes work if – as said above – PC-based Bitcoin mining is entirely unfeasible? When millions of computers are infected, their capabilities add up and they do actually manage to generate enough bitcoins to justify the effort of the hackers. This is essentially the description of Computta, only in its case – provided you fall for the scam – you grant access to the resources of your computing device voluntarily. There’s user feedback out there detailing how it’s essentially impossible to cash anything out of the Computta scheme, per the terms and conditions of the operation. Also, don’t fall for their promises that the software will barely use up any resources when you’re using the computer for something else. According to actual users, it will in fact cripple the system, and even if you are using a high-end gaming rig, it will not be able to meet the cash-out requirements. No. Their claims are unrealistic, and they look, feel and act like a Ponzi scheme. Also, no one is willing to step forth as the face of this operation. With Computta.com, you are essentially allowing a “tame” virus to wreak havoc on your system. Again: Bitcoin mining with a home PC has not been feasible for years now. When it comes to promises, Computta.com are very generous indeed. Not only is their software free, it will also not inconvenience its victims users in any shape or form. The setup is extremely simple: the application can be installed in two clicks (which is exactly two clicks more than required by the above mentioned crypto-mining viruses) and it is fully automated (that’s expected). Also: it will always be free. After all, you could be paying someone to let them use your computer too…you should be glad they are willing to use it for free. You don’t really have to be a cryptocurrency buff to see that everything about this operation is indeed a red flag. The core premise of the whole thing is faulty: PC-based Bitcoin mining is a ludicrous proposition. If you ever see someone try to sell you something based on this idea, just dismiss it as summarily as possible. Furthermore, the affiliate scheme to which a large section of the homepage sales pitch is dedicated, reeks of Ponzi scheming. This fits the above described scam model too: the perpetrators of this scam don’t have much use for one or two devices. They need to “infect” as many with their “smart miner” as possible. That way, they will actually be able to generate some bitcoins with which they will happily walk away when this whole thing inevitably expires. The YouTube videos featured on the homepage have drawn a bunch of negative comments. Some of the users there haven’t refrained from calling the operation a scam. Indeed, these videos are entirely unconvincing and quite sophomoric. The scam is obviously aimed at those who do not know much about cryptocurrencies and Bitcoin. Further down the Computta.com homepage, we have a testimonial, from a gamer allegedly named “Vijay Ramani” (or is it “Francisco Walsh?). The picture used for this person is a stock one, used on a bunch of other sites. Indeed, Mr. Ramani’s face is used to push everything from real estate to furniture, pet sitting and website design services. Scammers never really do learn in this regard, do they? The Computta.com website is privately registered and there’s absolutely no information available about the people behind the operation/website. Some people do call Computta.com a scam on various forums, though it is safe to say that for the time being, the operation has accrued a surprisingly small number of clap-backs. It is safe to assume that when their reputation goes truly rotten, they will just fold up shop, and re-appear on a different domain, with a different name. Computta.com is a scam. Do not let these people make use of your computer’s resources for free, to mine bitcoins they will happily pocket. To learn about legitimate ways to mine Bitcoin, check out our Cryptocurrency Mining Guide. This is not the best mining program, and shure they are gonna take a cut from your mining, BUT its NOT a SCam..please remove them from here because 100% of answers here confirm they are legit..
otherwise this site will lose confidence portraying false evidence..
depende de la cantidad y calidad de maquinas que dispongas y del lugar del mundo donde vivas por el precio de la energia electrica…..y del precio de la conexion a internet que logres conseguir….. Personally I tried several mining software, solution, etc… Some work good, some not. I agree, most of them doesn’t work well. But Computta work very good. Ok you’ll not be rich (like no other solution), but you can make some money. I received a payment around 40$ in february (I want to show the proof, but we can not send picture). If it continue like that, probably in middle of june I can request an other payment. You need a minimum pf 5 mBTC for a withdraw. Of course, you need a computer with a minimal requirement, but you didn’t need a PC Gaming. I’m sure that computta mines altcoins and pays out in BTC. I don´t understand that a page that is paying is classified as SCAM. The mining of Bitcoins is slow according to the CPU of each one but Computta pays! If you want proof of payment you just have to search the internet. As soon as I have mine, I’ll show you. I have been using this for two months with no problems. The amount mined seems to be going up every day because of the referrals joining. My computer is NOT overheating. I have NOT incurred any increase in electricity use. My computer has both CPU and GPU. Those who sign-in have a drop down menu that gives links to people they have paid and the amounts paid. Fact! I have 44 referrals in front line and 2 underline. I made 0.33 mbtc only with this huge amount of referrals.i can not say it is scam or not be cause i didn’t reach the minimum withdrawal limit but one thing it is sure.mining it is very slow. Computta client program mines CryptoNight currencies (like Monero) and Ethereum. Not Bitcoin. Not a fair write up about this company. I have used it and am getting paid from this company. Shame on you for slandering this. Give me the proof ??? 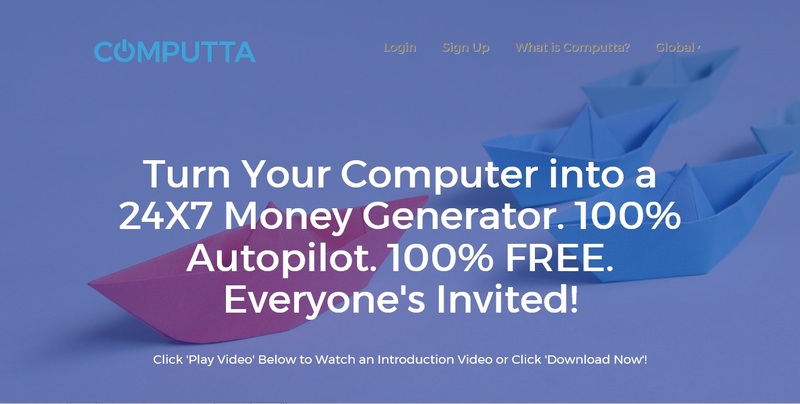 Hi, i’ve been using Computta for a while now and i can say it is not a scam, its really nice to use while you are not using your PC also even if you do, but the best thing is the referral program covering TIer1-5 referrals. This is quite a good way to obtain some passive income. Give me the proof !!! Show me the proof !!! They are Paying and I was got paid!